Fire: Nothing is more terrifying. The thought of flames racing through your home is probably your worst nightmare. Unfortunately, it is an all-too-frequent occurrence in this country. Every year, 4,000 Americans die in fires. The vast majority of those deaths occur at home—each year, 100,000 homes are destroyed, 40,000 family pets are killed. The LEADING CAUSE of death in a fire is asphyxiation. Fire consumes the oxygen in the air and increases the amount of deadly carbon monoxide, which causes a loss of consciousness or death within minutes. Fire victims rarely SEE the flames. Fire Lieutenant John Rogers said: "When animals are stressed, they hide from us, big-time. Because they are small, smoke affects them worse and quicker than it does a human." The U.S. has one of the highest fire death rates in the industrialized world. For 2001, exclusive of the events of September 11, the U.S. fire death rate was 13.4 deaths per million population. Between 1992 and 2001, an average of 4,266 Americans lost their lives and another 24,913 were injured annually as the result of fire. 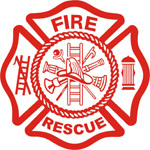 At least 80 percent of all fire deaths occur in residences. 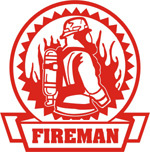 Between 1992 and 2001, an average of 1.9 million fires were reported each year. Many others go unreported, causing additional injuries and property loss. HOLLYWOOD, Fla. -- Hollywood firefighters had the unusual task of rescuing 24 pets from a burning home Wednesday. Hollywood police and fire rescue workers responded to the fire at to 2539 Johnson St. The house was reportedly engulfed in flames when they arrived just after 11 a.m.
Rescuers broke into the home where they found 18 cats and six dogs. They were able to rescue and revive most of the animals, though two cats reportedly died. The two women who live in the home were reportedly out of town, but are on their way back from Key West. The animals were taken to the Broward Animal Control. 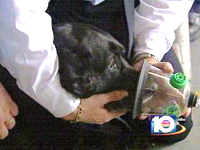 South Florida pets now have a better chance of surviving a house fire thanks to a gift from an animal rights group. 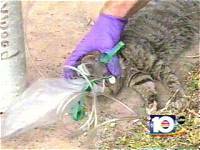 The Broward County Sheriff's Office Department of Fire Rescue and Emergency Services received 28 special oxygen masks designed specifically to treat dogs and cats. Broward Sheriff Ken Jenne showed the life-saving devices to the public this week. BSO purchased the animal oxygen masks with funds donated by the Animal Rights Foundation of Florida, a local nonprofit animal rights advocacy group. "Many of us consider our animal companions to be a member of our families,” Jenne said. "Thanks to this generous donation, their chances of surviving a fire have now increased dramatically." The masks are available in several sizes to accommodate each animal’s snout and to ensure maximum oxygen flow. SAN BERNARDINO, Calif. — As the dangerous fire season gets under way this summer, some California firefighters have saving pets as well as people in mind. This month, 11 San Bernardino city fire trucks will begin carrying animal first-aid kits, which include oxygen masks specially designed to fit cats and dogs. The devastating wildfires that charred thousands of acres in Southern California last year killed more than a dozen people and forced thousands of others from their homes. This year, in addition to putting out blazes and keeping people safe, the San Bernardino Fire Department wants to be ready to protect pooches and kitties that are in harm's way. In fact, firefighters and paramedics are in the process of completing pet first-aid training.